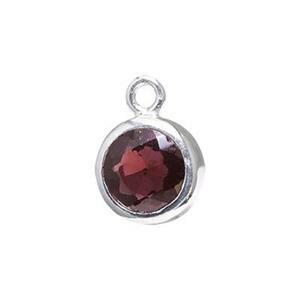 Sterling Silver 5.5x8.6mm Bezel Charm with 4mm Garnet, 1.6mm Closed Ring ID. Facet cut stone has a pointed culet at the back for maximum light refraction. But, the high bezel walls enclose the entire depth of the stone so the culet does not protrude from the back of the setting. Life. Color. Voice. Our SK43 – Bright Sterling Silver Bezel Charm with a 4mm Garnet Gemstone. The Birthstone for people privileged enough to be born in January. And for celebrating your 2nd Anniversary of Marriage. Adorn a pair of earrings made from our many Sterling Earring Findings.